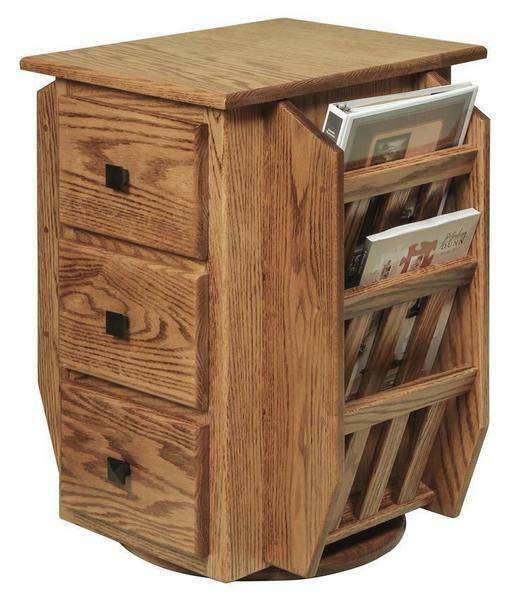 The Amish Hardwood Magazine Stand with Swivel and Book Shelf offers storage for books, magazines, papers and more! This solid wood stand has it all with racks for your favorite magazines on the sides and spacious shelves to hold books on the other. Opt for the solid wood drawers and enjoy storage for all your reading materials in one place. Perfect for the living room, family room or den, this magazine rack is a joy to use. The swivel allows you to access shelves, racks or drawers easily. Choose from premium solid hardwoods. This solid wood storage is offered in oak, brown maple, cherry or quarter sawn white oak wood. Made the Amish way, this durable unit will last for generations. Keep this wooden magazine stand in mind as a gift for the avid reader. 22" x 20.5" x 27.25"